We just had a shindo 6 (magnitude 7.4) earthquake in Sendai. It started pretty abrupt and pretty hard and after a second of hesitation the four of us who were downstairs preparing for tomorrow ran outside to the street and held onto whatever we could find. The telephone wires and everything was moving and shaking--not sure how much I can accredit to actual reality as much as the very very scary beating of my own heart. Definitely a hefty reminder of how important it is for us all to bond together during this time. Any one of us could be in an earthquake at any time--trapped under our own house or facing the loss of our loved ones. This earthquake just reminded me how close we all are--how lucky we all are to be alive. Anyway, we're okay. 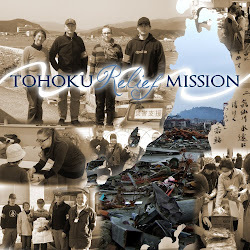 We're off to Ishinomaki tomorrow.